- Sari Colt on 三月 2, 2016. 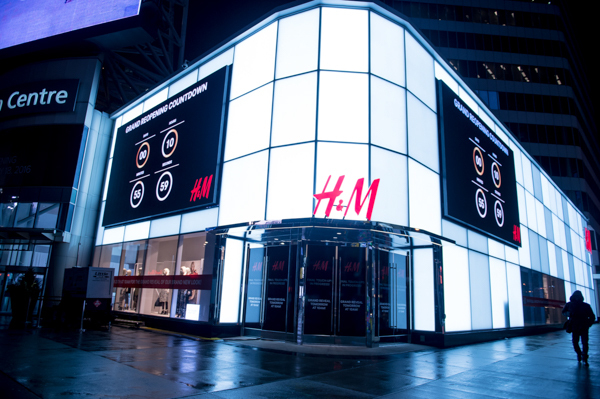 H&M relaunched its Canadian flagship store at Toronto’s Eaton Centre with a major party. Covering over 57,000 square feet, H&M‘s Eaton Centre location is one of its top ten largest worldwide, offering fashion-forward clothing and accessories for men, women, children, and now, H&M Home. Big, bright and airy, the H&M Eaton Centre store is easy to navigate, with a huge variety and selection of up to date styles. It also has a new storefront at the Yonge and Dundas corner with a fully illuminated LED façade and two new large digital screens. 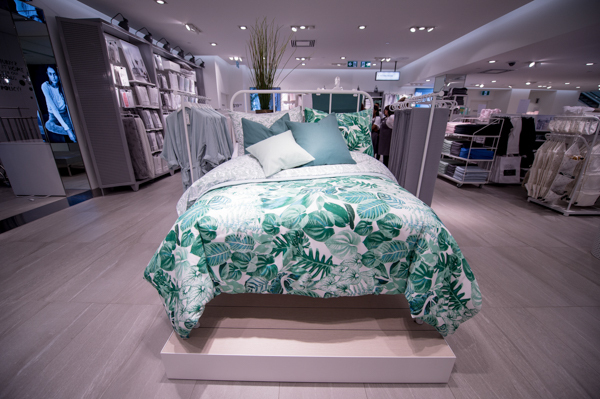 H&M Home, the first in Canada, is worth a visit alone. As we walked through the aisles, we fell in love with the jungle animal theme found in a variety of the accessories. Who could resist an elephant towel, or a zebra pillow case? We also liked the bedspreads with tropical palm trees that would brighten up any bedroom. The prices were very attractive and reasonable for all of the products. American actress, singer, songwriter, and fashion designer Taryn Manning (Orange is the New Black, Hustle and Flow) was one of the many special guests attending the celebration. Manning manned the turntables for two hours and did an excellent DJ set. Canadian Singer and Songwriter, Alessia Cara then took the stage, much to the delight of the crowd. Other notable guests included DJ and fashion bloggers Jay Strut, Caillianne and Samantha Beckerman, and TV personality Glen Baxter. Attendees had the chance to shop all the new products before the public with a 15% discount, and try a variety of exciting appetizers including octopus on purple yam, grilled cheese, jerk chicken in waffle cones, kimchi pierogies with bacon, smoked salmon, roasted cauliflower with curry stuffed in cucumber, and lobster tacos. They also enjoyed wine and delicious pear Stolichnaya Premium Vodka cocktails. It was one fun evening of shopping, sipping and grooving.